The TransNav 2011 Symposium held at the Gdynia Maritime University, Poland in June 2011 has brought together a wide range of participants from all over the world. The program has offered a variety of contributions, allowing to look at many aspects of the navigational safety from various different points of view. Topics presented and discussed at the Symposium were: navigation, safety at sea, sea transportation, education of navigators and simulator-based training, sea traffic engineering, ship's manoeuvrability, integrated systems, electronic charts systems, satellite, radio-navigation and anti-collision systems and many others. 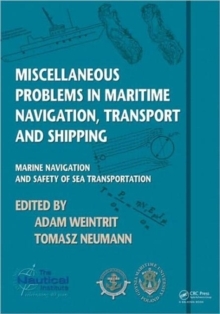 This book is part of a series of six volumes and provides an overview of Problems in Maritime Navigation, Transport and Shipping and is addressed to scientists and professionals involved in research and development of navigation, safety of navigation and sea transportation.